The Vista Cinch Custom Drawstring Backpack - a great new design! Open main compartment with cinch top. Drawstring design for shoulder or backpack carry. 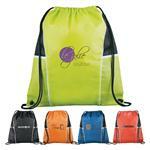 Features a large front Velcro pocket with mesh top. 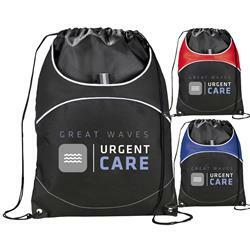 Stylish new design and quality construction make this a great upgrade to your standard drawstring backpack. FREE RUSH AVAILABLE! Available Imprint Options: Silkscreen, embroidery, epoxy dome, please inquire for costs. Open main compartment with cinch top. Drawstring design for shoulder or backpack carry. 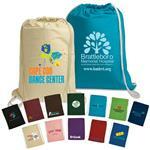 Features a large front Velcro pocket with mesh top. Cinch top.